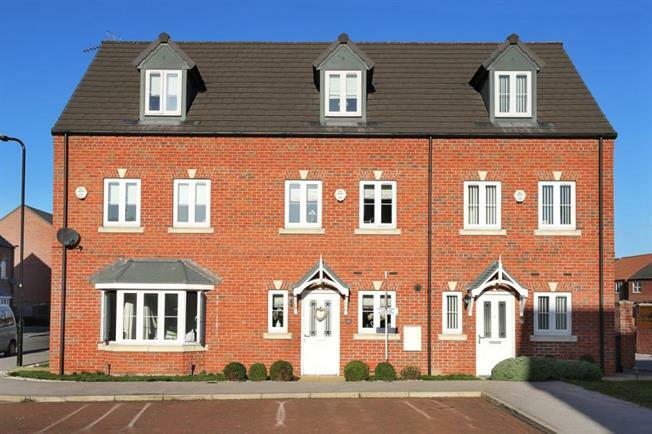 3 Bedroom Town House For Sale in Mexborough for £135,000. STUNNING, three bedroom, three storey mid townhouse. Having many upgrades when originally built. Situated in this popular location. Having dining kitchen and garage to the rear. Of interest to a varied purchaser the family home gives access to local amenities and commuter links. The contemporary styled property briefly comprises of entrance hall with stairs to first floor landing and door to dining kitchen. Dining kitchen with a contemporary style range of wall and base units including integrated appliances including washing machine, tumble dryer, oven hob and extractor. W.C having a two piece suite. Rear facing lounge having French doors to the rear garden. First floor landing two bedroom and family bathroom with a white three piece suite. Second floor landing having master bedroom with fitted wardrobe and en suite shower room having a white three piece suite. Outside to the front of the property is a forecourt style garden. To the rear is an enclosed garden mainly laid to lawn with patio area. There is also access to a single garage and drive to the rear of the property.